I received the new TECHART PRO a few days ago and so far I am impressed. This will be my first review on Sony Addict and I hope to make it a rolling one as I gain access to additional M glass. If there’s anything you would like me to prioritize (for example a lens) please leave it in the comments or contact me directly. Tonight I will be shooting another Burlesque Show (some photos NSFW) for fun which might be challenging. The 50mm f/1.4 Leica Summilux is by far my favorite lens to use on my Leica M240, but sometimes it can be difficult to focus in low light. It is my hope that the TECHART PRO and Sony a7II offer a superior experience when shooting under poor lighting conditions. I am really looking forward to putting this combination through it’s paces and trying additional glass like the Voigtlander Nokton 35mm f/1.2 II Aspherical in the future. 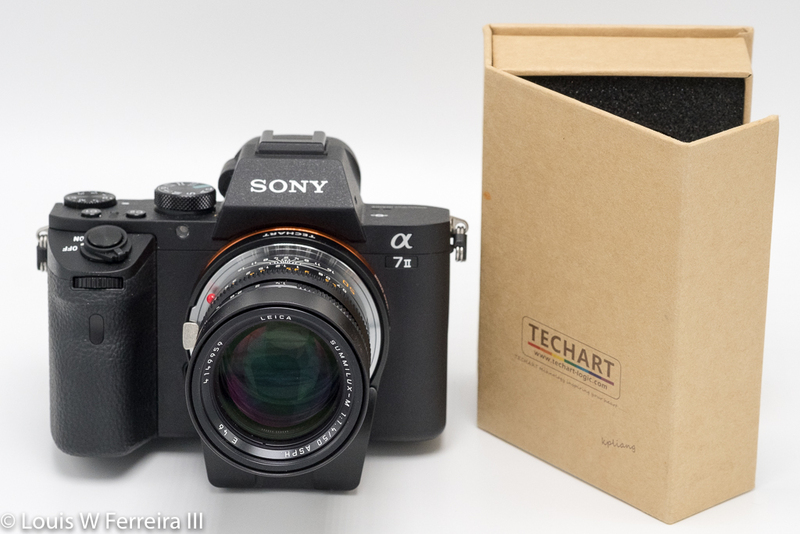 This entry was posted in 3rd Party Lens, Accessories, Reviews, Sony a7 II and tagged Leica 50mm f/1.4 Summilux-M Aspherical Manual Focus Lens (11891), Leica Summilux 50mm f/1.4, TECHART LM-EA7, TECHART PRO. Bookmark the permalink. Trackbacks are closed, but you can post a comment.